Perhaps the biggest spoiler of Star Wars: The Force Awakens is that it lives up to its pre-release hype. J.J. Abrams seems to have revived a franchise that, after the ponderously dull prequels, felt best left for dead. But Abrams has also done something very smart in The Force Awakens: he’s treated the source material—a hallowed god in the pop culture pantheon—with respect while adding something absent in the previous six films. Namely, women. As a franchise, Star Wars has always struggled with gender politics, something that proved inescapable even in a galaxy far, far away. Looking around, it seemed that along with the Jedi, women had virtually gone extinct. There was, of course, always Princess Leia; tough and able to fend for herself, she was hardly a damsel in distress, but she was ultimately a passive player subject to the larger forces that defined the Star Wars universe. The franchise has always fundamentally been a story of a battle between fathers (or father figures) and sons recast and expanded into the universal theme of clashes between good and evil, light and darkness, all with intergalactic consequences. Yet in the world of Star Wars, women had little to no access to controlling those forces. That Leia was capable of wielding the elusive but powerful “Force,” yet never did (at least in the films), was a defining aspect of her character. She was powerful, but her power was best used in the service of others. In the prequels, women fared far worse, their narrative purposes largely to give birth and then die. Shmi Skywalker exists solely for her son’s hagiographic purposes: She miraculously births Anakin, the result of a mystical pregnancy that adds to the deity-like qualities of her son, and then conveniently disappears, returning only to die, her violent death giving him that final nudge to the dark side. Meanwhile, Padmé Amidala is quickly reduced from a respected political leader to an enabler of her increasingly psychopathic and abusive husband. But there was, perhaps, no reason for George Lucas to engage with Amidala’s character development. Like Anakin’s mother, her existence in the narrative is quasi-religious, and as the hallowed mother of an important man, she needs to die to advance the plot. And so she dies simply because she loses the will to live. There are, of course, women Jedi in the prequels. Even a few are women of color. But it says quite a bit about the perception of women in the film franchise when none of them ever uttered more than a line of dialogue. Dead, disenfranchised, and silent seemed to be the fate of Star Wars’ women. But The Force Awakens is a welcome corrective to the gender problems that have haunted the franchise. A large number of women are cast in main roles: Carrie Fisher reprises Leia; Lupita Nyong’o is the 1000-year-old intergalactic pirate, Maz Kanata; Gwendoline Christie plays Captain Phasma, a currently minor character working for the Empire-descended First Order; and Daisy Ridley stars as Rey. 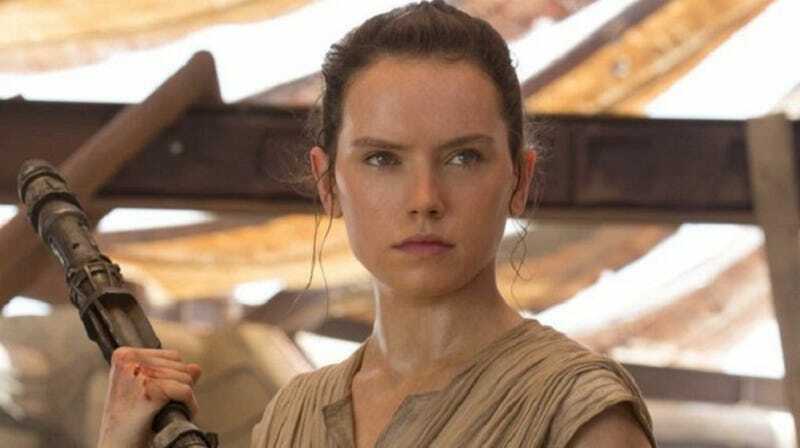 Rey is the most pivotal character in the film because [[[MAD SPOILERS]]] she’s the Jedi, or at least will be. Her backstory is intimately familiar: We first meet her on the desert-like planet Jakku where she’s been abandoned by unknown parents. There she ekes out her existence as a scavenger, picking up pieces of the remnants of crashed Empire ships, waiting for her family to return. Rey encounters BB-8, a Resistance droid in possession of valuable information whose owner, Poe Dameron (Oscar Isaac) has been captured by the First Order’s Kylo Ren (a very good Adam Driver). Dameron escapes, aided by Finn (the charming John Boyega), a Stormtrooper with moral concerns and surprisingly good aim. The pair crash on Jakku, Dameron disappears, and Finn serendipitously runs into Rey and BB-8. The trio has to escape from the First Order, who has descended onto Jakku in search of the very important droid. It’s then that we get the first feel of Rey’s independence. As she and Finn run from incoming fire, the well-meaning Finn attempts to grab her hand and pull her along. “Stop taking my hand!” she yells at Finn, a practical reminder that she doesn’t need to be saved. Abrams seems to trust Ridley, and she’s given quite a bit to do in the film, keeping with the director’s familiar fast-paced approach to action movies. So there’s a harrowing escape, the Millennium Falcon, Han Solo and Chewie, and some more danger before the trio, now aided by Han and Chewie, arrive at the home of Nyong’o’s Maz. Though Maz’s role is small in The Force Awakens, it’s a pivotal one. She’s in possession of Luke Skywalker’s lightsaber and it’s in Maz’s home, ostensibly through her guidance, that Rey begins to realize that she’s not destined to spend her life digging through the Empire’s scrapheap. Abrams toys with the “damsel in distress” theme that haunted the series prior; Rey is captured by Kylo Ren but, able to use the Force, she’s hardly in need of saving. This all leads, of course, to where all Star Wars movies lead: a lightsaber battle in which Rey competently wields the weapon that will undoubtedly become her companion in the later films. The action is tight and Abrams has always had a good sense of scale, but more importantly, he’s a filmmaker who’s confident in Ridley’s ability to carry the film and the physical nature of the action—and, frankly, she does. Abrams is practiced at giving a woman the space to helm an action franchise, and it’s no surprise that Rey’s action sequences have an Alias-like sensibility. Ultimately, The Force Awakens is a movie about generations, about passing the franchise on to a new generation of actors, passing down both the conflict and legacy of the original trilogy’s protagonists—of Leia, Han, Vader, Luke, and all of the aliens and droids that fleshed out the universe. That universe is still defined by broader forces—light and darkness; freedom and oppression—and the Skywalker family, now expanded, is still one of film history’s most dysfunctional. I’ll admit that my inner-geek fluttered when, at the end of the movie, Leia tells Rey, “May the Force be with you.” Perhaps, the fact that the new generation is more diverse, that women are finally allowed to wield the powers that define that universe, shouldn’t feel like such a radical shift, but in Star Wars and, more broadly in mass market science fiction, it is.